My dear Rev. Fathers, I am sure that you are quite occupied with Lenten programs, specially as the Holy Week and the Sacred Triduum are approaching. It has become a tradition to organize Penitential Services in all our Parishes with the neighbouring parishes helping on that occasion with individual Confessions. This tradition must be continued as we are providing an opportunity to many of our Parishioners, who otherwise, would neglect this sacred obligation. The Chrism Mass will be held on Monday 15th April at 5.00 pm at St. Anthony’s Cathedral, Kandy. Please be good enough to come prepared for the Concelebrated Solemn Mass and renew your Priestly commitment. 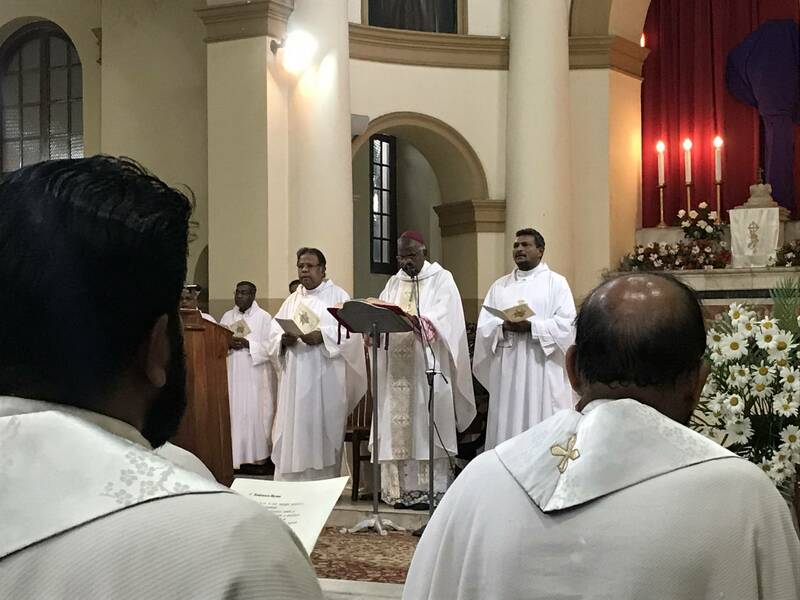 I wish to remind all the Parish Priests, in and around, Kandy to announce the date and the time of the Mass of Holy Chrism and encourage the faithful to participate in the same and pray for all of us, their Shepherds. I wish to congratulate Fr. 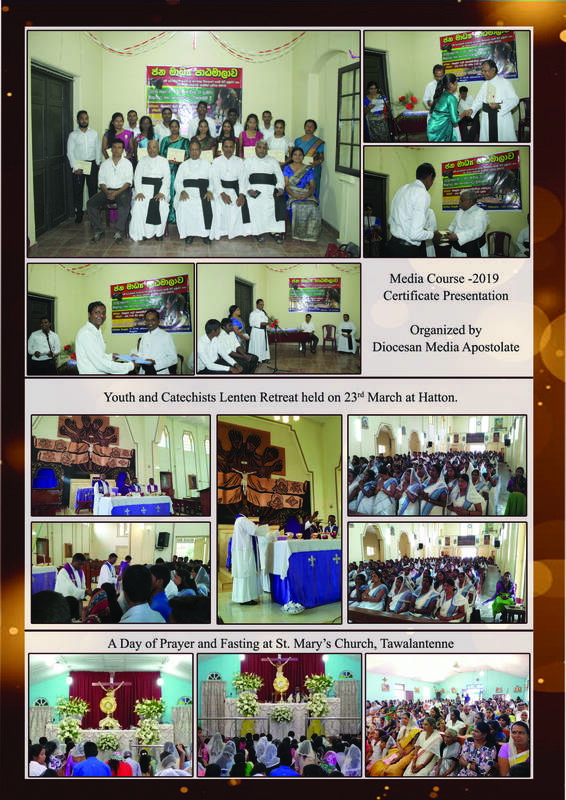 Soosainathan OSB, the Parish Priest of Katugastota for organizing a Passion Play with his youth group in the Parish. 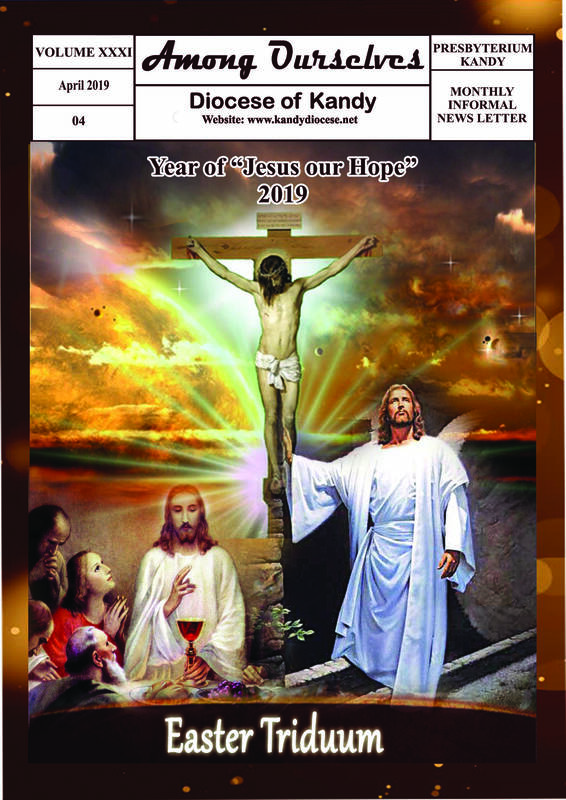 This traditional Presentation depicting the passion and death of Jesus Christ the Redeemer, helps our people, specially the youth and children to experience the Paschal Mystery in a spiritually enriching and striking manner. It is a good preparation for the Liturgical celebration of the Sacred Triduum. I hope many other parishes would follow this example as in the past. In our traditional Catholic villages, the singing of “Pasan” during the Season of Lent after the evening Rosary was a hallowed practice. I believe that you are animating your faithful regarding the importance of relating the sufferings of Jesus with the suffering of our people. The core message of Gospel is that we love God and love one another specially the poor and the marginalized. This year’s Lenten collection will be utilized for the purpose of animating our youth regarding the drug menace that is destroying our children, young people and our country. Please encourage our people, to contribute to this fund generously as a Lenten offering for the benefit of our children. It is sad to note that sometimes the former Catholic schools are either organizing or permitting events such as musical shows and dinner-dances during this Season of Lent specially close to the Holy Week. Every Parish Priest must be vigilant about such matters and request school authorities specially of former Catholic schools to help our children and families to maintain the spirit of the Season of Lent. Our sincere and heartfelt thanks are, hereby, conveyed to our outgoing Diocesan Media Director Fr. Sudath Perera. 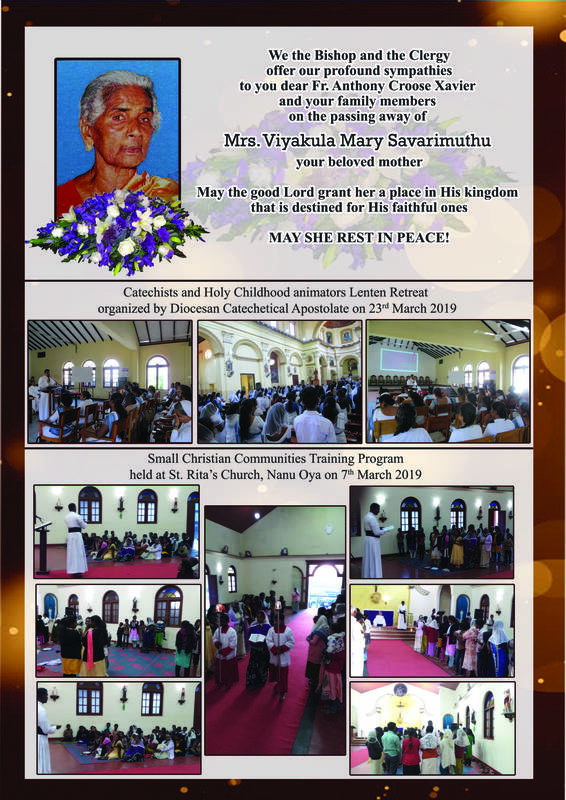 He is handing over the responsibility of guiding the Media Apostolate to the new Director after nine years of dedicated ministry in this challenging times. We wish God’s blessings to the new Media Director namely Rev. Fr. Leslie Perera and his team namely Rev. Frs. Roshan Almeida, Jayanath Perera, Anton Gavasker and Aruna Laksiri SSS who will assist him in this important Apostolate. Let me wish all of you and our beloved faithful and Religious a profoundly joyful feast of the Risen Saviour, filled with His blessings of joy, peace, reconciliation and a deep renewal of life. Alleluia! Alleluia!! Alleluia!!!. REV. FR. JAYANATH PERERA REV. Palm Sunday is also known as Passion Sunday in recognition of the beginning of Holy Week and Jesus’ final agonizing journey to His crucifixion. Falling on the sixth Sunday in Lent and the Sunday before Easter, Palm Sunday is celebrated in all major Christian churches—Roman Catholic, Protestant, and Orthodox. In many Orthodox churches, Palm Sunday is known as Entry into Jerusalem. In some countries, the graves of loved ones are decorated with palms. Since palm trees are not indigenous to colder climates, branches of sallow, willow, are often used. Sundown on Holy Thursday to sundown on Easter Sunday is considered the most solemn part of the liturgical year. This three-day period is referred to as the Easter Triduum, also known as the Sacred Triduum, or Paschal Triduum. Basically, the Sacred Triduum is one great festival recounting the last three days of Jesus’ life on earth, the events of his Passion and Resurrection, when the Lamb of God laid down his life in atonement for our sins. “Though chronologically three days, they are liturgically one day unfolding for us the unity of Christ’s Paschal Mystery” (USCCB). It is known as the “Paschal Mystery” because it is the ultimate fulfillment of the ancient Jewish Passover (or Pasch), which itself was a recollection of how God brought the Jews out of their slavery in Egypt. The spotless lamb was slaughtered at the Passover meal and consumed, and that night the destroying angel “passed over” the homes marked with the blood of the Passover Lamb, and those covered by the Blood were saved. This was the Old Testament prefiguration of Jesus’ work at the Last Supper? where he inserted himself as the Paschal Lamb? and Calvary, where the sacrifice was offered to save us from our slavery to sin. With the Holy Eucharist, we consume the victim that died for our sins. HOLY THURSDAY The evening Mass on Holy Thursday is referred to as The Mass of the Lord’s Supper. This is where the Church relives the institution of the Eucharist and the Holy Sacrifice of the Mass at the Last Supper, as well as the institution of the priesthood, which took place the evening before Jesus was crucified. After the homily there is an optional washing of the feet ceremony, where the priest washes the feet of others to signify his role as servant, just as Jesus did with his disciples. Extra hosts are consecrated at this Mass to be used on Good Friday when no Mass will be celebrated. The Mass of the Lord’s Supper on Holy Thursday concludes with a procession of the Blessed Sacrament to the “altar of repose,” a place where the consecrated host is kept other than the main altar where Mass is normally celebrated. GOOD FRIDAY Good Friday is a mandatory day of fasting and abstinence. This is the day of the crucifixion, the day Jesus died for the sins of the world. The parish altar looks very different on Good Friday, it is plain and bare. There is no consecrated Host in the Tabernacle at the main altar of the church; it was carried away on Holy Thursday night to the “altar of repose” to signify Jesus’ death. The candle by the Tabernacle is blown out, and the Tabernacle doors are left open to show that it is empty. Jesus is gone. This is quite dramatic, highlighting that Good Friday is a solemn day of prayer and mourning. The ceremony on Good Friday is not a Mass, but rather a communion service using the consecrated hosts from Holy Thursday. It often takes place at 3pm, the hour that Jesus breathed his last on the cross. Veneration of the Cross also takes place at this service, processing to kneel before a cross and either touching it or kissing it. Often the priest will begin the service prostrate in front of the altar. EASTER VIGIL / EASTER SUNDAY A vigil Mass is held after nightfall on Holy Saturday, or before dawn on Easter Sunday, in celebration of the resurrection of Jesus. This is called the Easter Vigil, the most glorious, beautiful, and dramatic liturgy for the Church. The vigil is divided into four parts and can last up to three hours: 1) the service of light, 2) the liturgy of the Word, 3) the liturgy of Baptism, and 4) the liturgy of the Eucharist. This is also the Mass where many in RCIA are brought into full communion with the Catholic Church. Read more details about each part of the marvelous Easter Vigil. 58. The Christian may shed tears today because God appears to be cruel but he will thank God tomorrow because of His infinite act of love! God’s love maintains one’s hope, an eternal and joyful hope. DIVINE LOVE ABOUNDS IN HOPE 59. In His infinite goodness, the God of hope fills the loyal Christian with joy and peace in believing so he will abound in hope through the power of the Holy Spirit. [Rom. 15:13] This is one of the many earthly rewards bestowed upon the Christian who seeks the way of God. Profound sadness coupled with terror wrapped Peter’s stomach and clenched it into tight, painful knot. Yes, Jesus had told his disciples that he would be killed, even that he would be crucified. But Peter hadn’t believed it. When you see daily miracles and hear incisive teaching from a confident public figure, you refuse to acknowledge that anything could ever change. But overnight, Peter’s world collapsed. They had eaten Passover together on Thursday night. But only few hours later, Jesus was under arrest. A hasty trial lit by flickering lamps in the high priest’s palace condemned Jesus. Then earlymorning shuttles to Pilate, then Herod, then back again to Pilate sealed his fate. By 9 am soldiers were pounding nails into his hands and feet, jerking him upright on a cross to let him hang in the sun — until the sun itself hid its face and left the onlookers to watch the Master die in the eerie chill of this very black day. Peter had fled. In fact, none of the Twelve remained to see him buried. Only Mary Magdalene and a couple of wealthy followers were left to take his body down, carry it outside the city, and entomb it. If you’ve ever felt despair at the pit of your stomach, then you know what Peter felt. When he did go out, he would walk in a kind of daze, utterly disoriented, shattered, the center of his world now a black hole, an empty void. How could the Messiah, the heir of David’s throne, be executed? It went against all logic. It was impossible — yet it had happened, and oh so swiftly! Peter slept fitfully Saturday night and when his eyes opened Sunday morning, the doom of death was heavy upon him. He pulled his cloak over his eyes, hoping he could fall back to sleep, but knowing he wouldn’t. Peter pulled his fellow-disciple John to his feet, slammed the door behind them, and began to run through the narrow streets, out the city gate, and then on to the tomb. The great stone that had sealed the tomb stood open. As they entered, the sepulcher was empty, except for some folded grave clothes. The body was gone. Folded? That was strange. Folded grave clothes but no body. Hardly what you’d expect from grave robbers. John seemed convinced by the grave clothes that somehow Jesus had been resurrected or something, but Peter wasn’t so sure. How could he believe that after so much had happened? He walked slowly back towards the city pondering, thinking, wanting to believe, but afraid to hope. Suddenly, Jesus appeared. Peter, the so-called “rock,” had publically betrayed him. He had shouted, “I don’t know the man!” He was so unworthy. And yet here was Jesus before him. Peter fell to his knees and wept for joy. Peter never said much to the others about this meeting — what had been said, what had transpired. But after that you’d sometimes see Peter deep in thought, pensive. Then he would nod his head and traces of a smile would begin to transform his face into one written with thankfulness and joy and peace. Peter had been whipsawed from his pit of despair and pulled by the Master into peace. Life had changed for the good. And since then many have found this same peace, this same smile of wonder at Jesus’ amazing grace. Maybe you too. Jesus had risen — and Peter never doubted him again. THE HOLY OILS “A SERVICE of great solemnity and beauty takes place in every cathedral church [at the chrism mass] each year. The Bishop blesses the oils which are to be used during the ensuing year in the administration of the Sacraments, as well as in various consecrations and blessings of persons and things. The ceremony of the Blessing of the Oils is full of significant symbolism. It requires the presence of a large number of the clergy, for the sacred oils are considered by the Church to be of such importance as to call for… an imposing ceremonial. Few inanimate things receive more … honor than the oils which are to be used so often during the year in the imparting of God’s grace through Sacraments and blessings. Each of us Catholics has received already some of the benefits given through these holy oils, namely, in the ceremonies of Baptism and in the conferring of the Sacrament of Confirmation; and we hope some day to obtain further graces through them in Extreme Unction [the Sacrament of the Sick]; and yet it may be that we know little about them. Moreover, few of us are able to be present when the solemn blessing of them takes place in a cathedral church. Therefore this chapter will be devoted to a description of the nature, the uses, the history and the blessing of the Holy Oils. 1294. “Anointing with OIL has all these meanings in the sacramental life. The pre- baptismal anointing with the OIL of catechumens signifies cleansing and strengthening; the anointing of the sick expresses healing and comfort. The post- baptismal anointing with sacred chrism in Confirmation and ordination is the sign of consecration. By Confirmation Christians, that is, those who are anointed, share more completely in the mission of Jesus Christ and the fullness of the HOLY Spirit with which he is filled, so that their lives may give off ‘the aroma of Christ. '[2 Cor 2:15. ]” Catechism of the Catholic Church. The Symbolism of Oil. In the countries of the Orient and in southern Europe, olive oil has always been a necessity of daily life, much more than with [Americans]. It enters into the preparation of food; it is used as a remedy, internally and externally; in past centuries it was the chief means of furnishing light, being consumed in lamps; it was employed in ancient times by the athletes of the Olympic games, to give suppleness to their muscles. Hence we see the various symbolic meanings of which the Church takes cognizance when she uses it to give us spiritual nourishment, to cure our spiritual ailments, to diffuse the light of grace in our souls, and to render us strong and active in the never-ending conflict with the Spirit of Evil. The use of oil to express the imparting of spiritual strength is so appropriate that the Church employs it not only for the anointing of living beings but also for bells and chalices and other …things which are to be used as aids in the sanctification of her children. The oils blessed [at chrism mass] are of three kinds — the Oil of Catechumens, the Chrism and the Oil of the Sick. Each of them is oil extracted from olives, but the Chrism is distinguished from the others by having balm or balsam mixed with it. Each of these is blessed by the Bishop with a special form of prayer, expressing the purpose for which it is to be used and its mystical signification as well. 695. “Anointing. The symbolism of anointing with oil also signifies the Holy Spirit,[Cf. 1 John 2:20-27…] to the point of becoming a synonym for the Holy Spirit.” Catechism of the Catholic Church. The Oil of Catechumens. This kind of sacred oil is used in the ceremonies of Baptism, and derives its name from that fact — a catechumen being an instructed convert who is about to receive the Sacrament of Baptism. [During] the administration of that Sacrament [to a child,] the priest says “We anoint you with the oil of salvation in the name of Christ our Savior; may he strengthen you with his power, who lives and reigns for ever and ever.” The priest makes with this oil the sign of the cross on the [breast of the] person who is to be baptized… Why are these unction [anointing] used? Because the catechumens are considered to be to some extent under the power of the Evil One until they have been united to Christ’s mystical body, the Church, by Baptism.” Sullivan, Externals of the Catholic Church (1917). The use of balsam in the Chrism dates from about the sixth century. Balsam is a resinous substance which is procured from terebinth trees, which grow in Judea and Arabia; and similar substances of even greater excellence are obtained from various plants in the West Indies and tropical countries. In some Oriental rites, a great variety of sweet-smelling spices and perfumes are used in addition to the balsam. The mixing of this fragrant material with the sacred oil gives the latter the name of Chrism, which signifies a scented ointment. As oil typifies the fullness of grace imparted through the Sacrament, so balsam expresses freedom from corruption and the sweet odor of virtue.” Sullivan, Externals of the Catholic Church (1917). 1241. “The anointing with sacred chrism, perfumed OIL consecrated by the bishop, signifies the gift of the HOLY Spirit to the newly baptized, who has become a Christian, that is, one ‘anointed’ by the HOLY Spirit, incorporated into Christ who is anointed priest, prophet, and king.” Catechism of the Catholic Church. The Oil of the Sick. This sacred oil, called in Latin “Oleum Infirmorum,” is the “matter” or necessary substance for the Sacrament of [The Sacrament of the Sick, formerly known as] Extreme Unction… In the Churches which follow the Latin rite this oil is always pure, without admixture; but in some Eastern Churches it contains a little wine or ashes. As regards the use of this oil in The Sacrament of the Sick, we know that it was employed in Apostolic times practically in the same manner as now. St. James, in his Epistle, thus instructs the faithful of the early Church: “Is any man sick among you? Let him bring in the priests of the Church; and let them pray over him, anointing him with oil in the name of the Lord. And the prayer of faith shall save the sick man, and the Lord shall raise him up. And if he be in sins, they shall be forgiven him.” James 5:14-15, see Mark 6:13. If you have an idea perform it. If you have a knowledge give it out. If you have a goal achieve it. Love, share and distribute, do not keep it inside. We appreciate with enormous joy the wholehearted cooperation extended for the success of the “Vocation Sunday 2018”. This year too, with a lot of trust and confidence we appeal to all the Parish Priests, Heads of Institutions and Apostolates to organize “Vocation Sunday” Liturgy, Holy Rosary, other Spiritual Activities and Programs for the Children of Sunday Schools to motivate and promote vocations to the Priesthood and Religious Life. 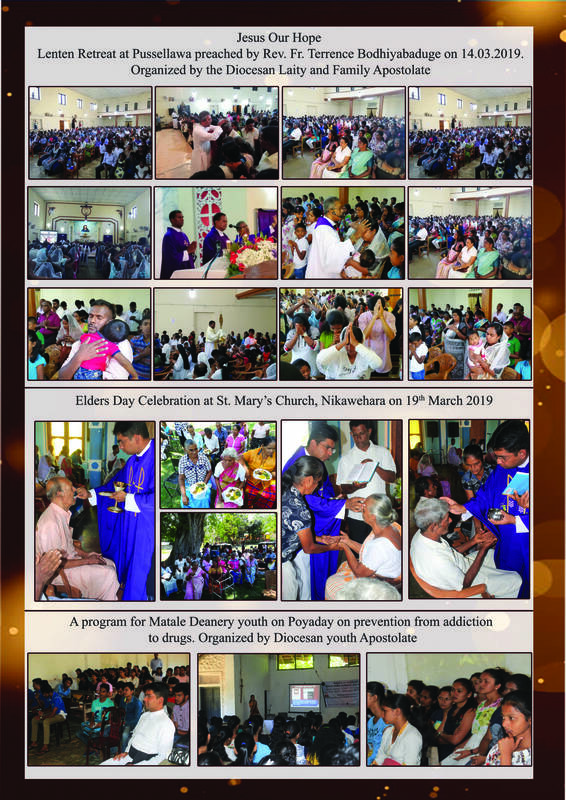 Whilst thanking you for the unstinting generosity extended last year, we kindly request you this year too, to deposit the “Sunday Collection/ Contribution” collected with the Procurator General to support two major Seminaries in Ampitiya and Jaffna, and the Intermediate Seminary, Kalutara. We rely and count on you for a successful celebration of “Vocation Sunday 2019”! Rev.Fr. Expeditus Jayakody Fr. 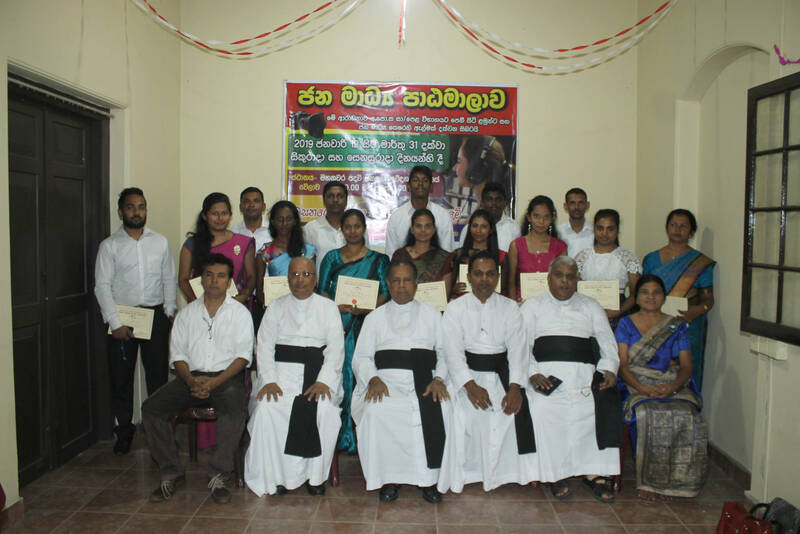 Rector – National Seminary, Ampitiya & The Organizing Committee.